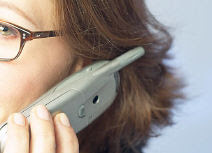 Cell Phones: Should they be banned? Today, more and more students carry cell or mobile phones while at school; however, as a teacher, I find it sometimes difficult to keep students on task because cell phones go off during class, and students sometimes text their friends during the lessons. The question is whether schools should ban cell phone in schools. So, what rules, if any, do schools have in your country to deal with the growing issue of cell phones. Share your ideas. Harry Potter: Has he changed reading habits? Listen and write your opinion on the topic. Listen and share your ideas on the topic. Childbirth: What is the man's role? Having children is a wonderful, yet often nerve-racking, experience for the man and the woman; however, the man's role in the birthing process can vary from culture to culture. When I had my first daughter years ago, it was the expectation that I would go into the operating room, hold my wife's hand, and give your comfort and encouragement as she was having the baby. Furthermore, the doctors asked me to help clean and wrap the baby in warm blankets immediately after she was born However, when we had our other children in Japan several years later, I was asked to wait outside until the baby was born. In other words, the father had less of a role in the birthing process, particularly when the woman underwent a cesarean section (an operation by creating an incision to remove the baby). So, what about in your cultures? What is the man's role when a woman gives birth? Is he present in the same room? Does he help the doctors in any way? Share your ideas. One of things I have discovered is that raising children in different cultures is often shaped by social expectations and family background. When I was a child, parents in the US tended to use an authoritarian style where they led the family like a military leader and lectured ("my way or the highway") and often punished physically. With my own father, he gave us a look, and we knew we had to obey. No questioning. I really respected my father, so I tended to obey. Now, I tend to take more of a counselor method, trying to validate and listen to my kids as they try to solve their problems. However, I teach my kids to be accountable for their actions. If they make a choice, there is always a consequence, and they can't choose the consequence. I don't pamper my kids, and I have told them early in their life that they should plan to a good part of their college education because I want them to learn how to manage their lives better. So, what are your thoughts on the topic? What kinds of parenting methods do parents use in your own culture, whether they are effective or not? Share your ideas. Animal Sounds: Are they the same? Gift Giving: What is your tradition? Many of you might have taken my recent poll on the factors that contribute to faster learning, and according to the survey, most people feel that motivation is the most important factor . . . even more important that the amount of exposure to the new language. This is very interesting because this reflects my own experience as a teacher in the ESL classroom. Often, some students who come from overseas to study in the US only see that living in the US is the key to improving their English; however, in some cases, they often do not make much progress because as soon as they leave my class, they pair up with other students from the same country and start speaking their native language again. The problem isn't that they are just associating with people from their country, but that they don't speak English when they do so. Only the other hand, I have met many students who have made great progress in learning English because they are very motivated to do so and find every opportunity to study and put into practice their new skills. In fact, I know students who have learned English very well without having lived in an English-speaking country. So, what has your experience been like? What are the factors that help students learn more quickly? Share your ideas. Although dating is common throughout the world, its practices are not universal. In fact, in many cultures, dating, as many of us see it, is not encouraged, permitted, or desired. However, when we don't understand the behaviors and values of other cultures, we often misjudge people and what they do. Furthermore, the concept of the ideal date can differ within the same culture, depending on the interests, age, educational background, and experiences of the individual. For example, one might enjoy going out to eat and catching a movie. In my case, before I got married, I enjoyed doing things in the outdoors like packing a lunch and going on a hike in the mountains. I chose this kind of date not because of my culture, but of my personal interest in enjoying nature outside. So, what about you? What is your image of the ideal date? What dating activities are acceptable in your culture, and which are not? Share your ideas. Culture Shock or Re-entry Shock: Which is harder? Listen and share your experiences about the topic. Technology: Does it really help in the classroom? For many years, computer and software companies have claimed that computers can help students learn, but some say that many of the studies to show this have been done by the companies themselves. Is the computer industry just trying to sell computers, or is there real evidence to prove this? Have computers help you learn English? If so, share your experiences. Language Learning: Who Learns Better? Listen and write your ideas on the topic. Many international students coming to the United States quickly discover that getting into a North American college or university is much harder than they imagined. Unfortunately, students often think that a few quick months at a language school should prepare them enough to pass the TOEFL test. The reality is that in addition to more time to digest and learn the language, classroom expectations and requirements can be very different. For example, some of my students are often shocked that to get an A in my class they need 94% in the class (very common requirement in the US), and that passing is at least 60%, not 50% as in their countries. So, please share your ideas on the subject of getting into a university in your country and the things international students might find surprising in terms of university requirements and classroom expectations. When I was a kid back in the 1960s and 70s, children spent most of their free time playing outside with their friends in the sandbox, at a swimming hole, or in the woods, climbing trees. There were times when we would also play board games like Monopoly or chess, or just shoot some basketballs. However, we live in a different world now. More and more kids play video games hours on end, often without adult supervision or guidance. The question is what kind of impact is this having on children's social, emotional, and physical well being. What about online gaming? Share your ideas and experience on this topic. Body Language: How important is it? Listen and write your comments about what you hear. Living Grammar: Which is the right way? Actually, the formal grammar rule states that in present unreal conditional sentences, the verb in the condition statement (“if I was rich”) is changed to a past tense verb, but the BE verb is irregular, and thus changes to WERE no matter which pronoun is used (we, they, she, he, I). The irregular form is what is problematic for most native speakers (although they might not realize it is incorrect), and within a few years, this usage might become completely acceptable. Now, share your ideas. What grammar rules do you know of that seem to be used differently from what we found in formal textbooks? 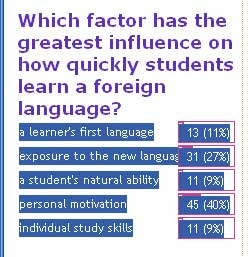 Over the past week, visitors have responded to the question as to which language skill is most important to them. Not surprisingly, speaking and listening appear to be the most important language skills to students. The question, then, is how can students improve their communication skills, particularly in countries where English isn't the native language. Share your ideas on this topic. Classroom Differences: Why do they exist? How long does it take to learn English? Wow, a difficult question indeed. In fact, I am asked this question more often than any other question, but the answer isn't an easy one. There are so many factors than influence how fast and how well a student picks up a new language. One thing that I mentioned in an earlier post is natural ability. In other words, some people have a gift for learning languages; this isn't something they can buy. Rather, these students just seem to be able to learn quickly and with less effort than the rest of us (including myself). So, share your ideas. Besides natural ability, what other factors affect the speed at which a person picks up a second or third language? Listen to the topic and share your comments. Also, visit http://www.trainyouraccent.com. Many students use the Internet to improve their English skills; finding the best sites for you often takes time. How about helping other students find some good sites to improve their language skills. Many of these sites are designed for language learners; others were created for native speakers. 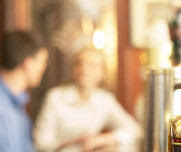 One of my favorites is Conversation Questions for the ESL/EFL Classroom at http://iteslj.org/questions/. This site has a huge collection of questions students and teachers can use to start conversations. How about you? What sites can you recommend to other learners? Write about your favorite Websites here. Listen to the topic and share your ideas based on what you hear. Let's face it: not all language teachers are the same, and we could probably identify a number of characteristics that make a great ESL teacher. Of course, we don't want to pass over a student's need to work hard, but teachers have a great impact on how students learn. For me, the ideal teacher is one who not only knows the subject well, but can present it in a way that targets my own learning style. I'm a very visual learner, so I like teachers who use pictures, video, and presentations to help me grasp the content. What about you? What is your image of the ideal teacher? Share your ideas. Listen and write your comments about the topic. Eating habits can vary from place to place and even from family to family. If you travel, it is good to know some of these differences so you fit and don't look out of place. In Japan, people use chopsticks for many of their meals, but their are rules for using chopsticks as well. First, you should never lick your chopsticks. Next, you should never pass food from chopsticks to someone else's chopsticks because something like this is only done during a funeral. Also, don't leave your chopsticks sticking out of a bowl of rice or similar food item. As you can see, the simple idea of eating with chopsticks is more complex than it first appears. So, please share and eating customs or habits people should know if they visit your culture. Listen and share your opinions about the topic based on what you hear. Listen and then write your ideas on the topic. Learning new vocabulary is key to improving communication; however, coming up with an effective method to learn new words is a different story. Thus, instead of jotting (or writing quickly) every word you see, first decide whether the word is something you would use over and over again. 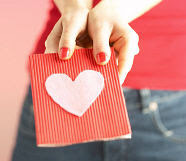 Next, write the word in a notebook or on a small card with an easy definition AND a sample sentence or two. Without a sample sentence, you will have no way of knowing how to use it. So, what ideas do you have for learning new words and then using them in your conversation? If you have ever visited a new culture, then you know that culture shock can happen, that is, a feeling of disorientation or confusion in which the rules of your culture no longer apply. I remember in one country I visited that the distance between speakers was greater, and when I moved closer to my conversational partner, the person moved backwards. Then, I felt uncomfortable being so far away, so I moved closer again. This cause a lot of confusion. Now, share your personal story on culture shock and how we can adjust to these differences. Do you have any ideas on this topic? Listen and write your comments. Once of the greatest challenges facing students who travel to a new culture is carrying with them stereotypes or incorrect images of the target culture. Such images can be seen in the media (movies, music, and newspapers), and these images can lead to negative judgments about others. A simple example of a stereotype is that all North Americans love fast food and pizza. This is obviously not true. Some North Americans do eat a lot of fast food, but even more and more restaurants serve healthy food choices. What stereotypes do people have of your culture? How can this affect how they interact with others. Please share your ideas. Do native English speak too quickly for ESL/EFL students? Listen to this discussion and write your own comments on the topic. The Chinese philosopher, Confucius, is reported to have said that "a journey of a thousand miles begins with a single step." How could this relate to language learning and culture? How does this apply to you or someone you know? Share your experiences. What are the keys to learning a language? Listen and share your ideas. Learning new vocabulary requires than memorizing random lists of words. Instead, students might try to focus on vocabulary related to a specific topic like food, furniture, clothing, or animals. Also, focus on high-frequency words, in other words, vocabulary that you would use on a regular basis.